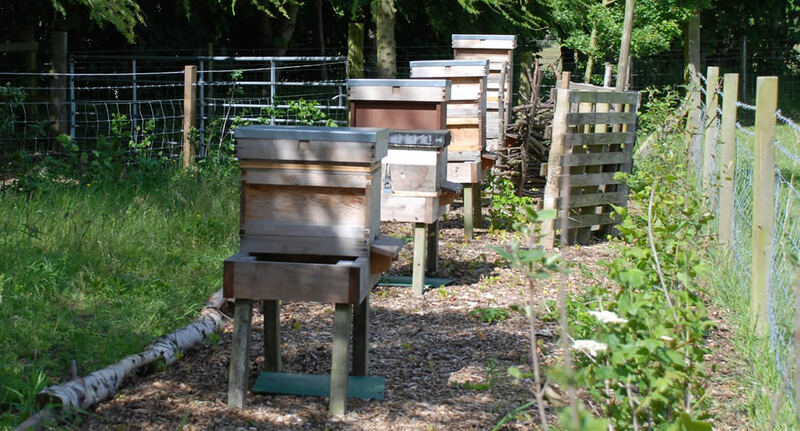 The Dalmore apiary is home to our honey bees. We currently host four colonies of European honey bees, who forage nectar and pollen from our apple orchard, vegetable, fruit and flower gardens, as well as the local farms, gardens and countryside. They perform a very important job in pollinating our apple trees and other plants, and we try hard to help them stay healthy and productive. A healthy hive of bees will produce more honey than it can consume, and this enables us to harvest honey at certain times of the year, without harming the bees. We always leave enough honey on the hives to help the bees through the winter months when they depend on food stored in the previous foraging season. We sell both clear and soft-set honey, and occasionally also have comb honey for sale. Apart from being extremely tasty, local honey is thought to help with pollen allergies. The theory is that the honey will contain small quantities of the local pollens that trigger hay fever, and allow the body to build up resistance without the severe symptoms of an allergic reaction.